Fast-Trac Designs had a very cool project this week that was yet another unique wrap. Our customer came to us with a golf cart and requested that we wrap it to look like a Tonka truck. Our graphic artists took on the challenge and produced an abstract yet rough looking design that fit very well with what the customer envisioned. This week at Fast-Trac Designs we had another pontoon boat in the shop to get a customized wrap to look like the General Lee Charger. The pontoon featured a vibrant orange, (that we went through many color tests to achieve.) a tattered confederate flag and the number 01. The wrap installation was successful leaving us with an incredible outcome and most importantly the customer was highly satisfied with their new boat wrap that is now know as The General Lee Pontoon. 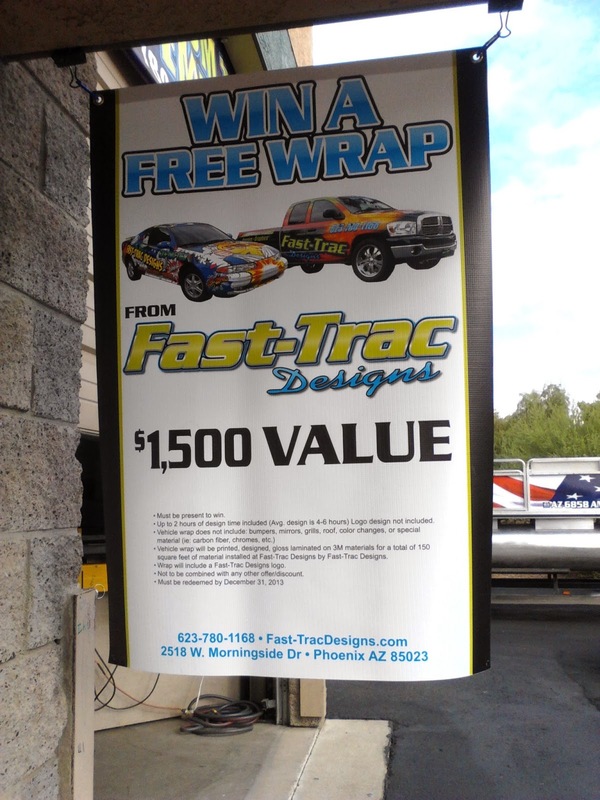 Fast-Trac Designs hosted an Oktoberfest Customer Appreciation Day on Tuesday October 29th, 2013. We really couldn’t have asked for a better day or turn out. The weather was perfect, the food was good, the vehicles on display were quite an attraction and with all of those factors it added up to be an awesome day at Fast-Trac Designs. One of the main events was the free raffle that featured gift cards to restaurants, free services from Fast-Trac Designs, AYS Garage Door Service, Bills Landscaping and Desert Foothills Handyman Service. Did we raffle off a free vehicle wrap? Of course! The winner of the free vehicle wrap was AMP Upholstery and they were stoked to obtain the grand prize. We send special thanks to our sponsors Shake, Rattle and Troll Outdoors Radio, Classic Car Concepts, VooDoo Bikeworks, Bills Landscape Service, 96.3 Real Country, Desert Warriors, At Your Service Garage Door Repair, Spirit Of Connie, Desert Foothills Handyman Service, and our vendors Fellers, Multicraft, Wholesale Signs Supplies and Montroy. Another big appreciation to all who brought their vehicles to display and to our cooks Natalie and Jeff who did an awesome job at serving our guests, we couldn’t have done it without you all! We look forward to seeing everyone next time.